Spring and summer is the time when I really love to spend time outdoors, doing my favourite activities, cycling and hiking. It’s the best time of the year! Do you enjoy it as well? But do you always remember to take your sunscreen with you? Remember, it’s very important to take all the necessary steps to prevent sunburn as skin cancer rates are on the rise and if you sunburn, this actually doubles your risk of getting a skin cancer. Natural sunscreens are better because they don’t contain harmful preservatives and toxic substances which your skin could absorb and they are better for the environment too, but which one should you buy? Over the last few years I tried quite a few natural and organic sunscreens so I know what’s good and what’s not that good. I must admit though, I am still on the lookout for my perfect natural sunscreen and I will continue testing new brands until I find something which I really really love. So which natural sunscreens would I recommend and which ones I wouldn’t? Let’s begin.. I remember buying two organic sunscreens from Green People before going abroad one year, one for myself and one for my boyfriend. This was the first time I bought a natural sunscreen and I wasn’t sure what to expect. For myself I bought a sun lotion with SPF 25 (this was the highest SPF Green People were doing at that time, now they do SPF 30 as well) and for my partner I bought a sunscreen with SPF 15 – this was actually a sun lotion with tan accelerator. My boyfriend totally loved his sunscreen. It didn’t leave any whiteness behind and it did actually help him to get a nice tan (although the tan is not really good for you as it means that your skin has been damaged by the sun!). This sunscreen spreads easily and is quick to absorb. Get 15% off Green People’s sunscreens, use the code HEALTHY15. The sunscreen with SPF25 that I was using was ok but when we were cycling it actually made me sweat more. I remember feeling my arms wet on the surface of the skin and my face was the same. I didn’t really like that but maybe since then they changed the formula. If you are in the sun but not doing any sports, then this sunscreen should be fine for you. It did protect me well and I didn’t get sunburnt. You can read a full review of this facial sun cream here. In summary, this sunscreen is non-greasy, easy to apply and does not leave any whiteness on your skin. It’s great for combination skin as it’s not heavy and does not cause breakouts. It’s scent-free which makes it suitable for both women and men. What’s great about natural sunscreens from Green People is that they are of a really high quality – they contain over 80% organic ingredients and they are free from synthetic fragrances, mineral oils, alcohol and parabens. Green People’s aim is to bring you the purest sunscreen that nature can offer. Just to mention that Green People use nanoparticles in their organic sun lotions, but if you are worried about that they explained their reasoning in detail here. I really liked the sun milk from Annemarie Borlind which I bought in Slovenia actually. You can also buy it in the UK – I managed to find it on Amazon. I actually wrote a full review of this sunscreen here. In summary, the Annemarie Borlind sun milk is easy to apply (it’s not too thick), it’s quick to absorb and does not leave any white residue behind. It doesn’t contain parabens, mineral oils, silicones, PEG, synthetic colours and animal extracts and it protects you from both, UVA and UVB sun rays. Also to mention, the sun milk does not contain nanoparticles and the brand does not test on animals. This sunscreen is pretty rich, feeling slightly greasy. It also leaves shine on the skin which diminishes a bit over time. It does contain alcohol but I didn’t find it drying as it’s rich in moisturising oils. It also contains phenoxyethanol, a preservative which some people find controversial. However, there is no evidence to say that phenoxyethanol is harmful, in fact lots of natural brands choose to use it. I learnt about this preservative after using this sun milk and now I’d rather not buy products which contain it, just because I want to use products which are more natural. You should not be put off though. This sunscreen is a great alternative to conventional sun creams and I have recommended it to my sister who went ahead and bought it. Read a full review of Biosolis Extreme Fluid here. One major negative is that it leaves a white cast on the skin so it’s not suitable for people with darker complexions. It takes a bit of time to apply it everywhere as you have to massage it into skin really well. This is a really good sunscreen but I would recommend it only to people who are naturally pretty pale. If you are not pale, sorry this sunscreen is definitely not for you! 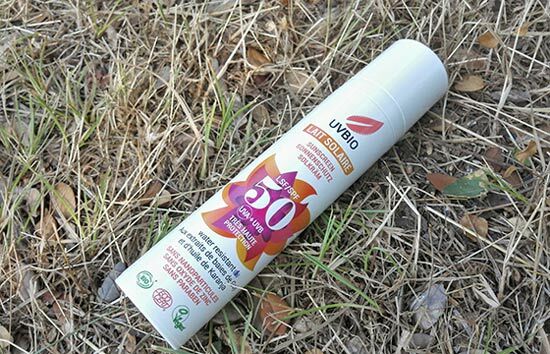 Another high SPF sunscreen which I tried, UVBIO Sunscreen SPF50 is a water resistant sun cream which protects against UVA and UVB rays. Its formula is based on naturally derived ingredients with 22.18% ingredients from organic farming. It contains no nanoparticles, no palm oil derivatives and no preservatives from synthetic chemistry (no parabens). It holds the following certificates: Cosmébio, ECOCERT and UK Vegan Society. Full review here. 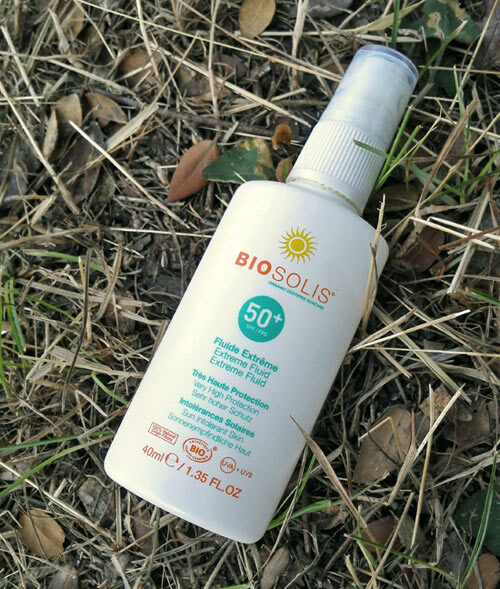 Comparing to Biosolis, UVBIO sunscreen is easier to distribute onto the skin (due to the oils it contains). In terms of whiteness that cream leaves behind, it’s better than Biosolis Extreme Fluid sunscreen. You just need to massage it really well and whiteness almost totally disappears and blends with the skin colour (it’s good for fair tones but may not be suitable for darker-toned skin types as it does make your skin paler ). This sunscreen is also suitable for children. Odylique Natural Sun Screen is a relatively new sunscreen on the market (came out in 2016) and it’s one of my favourite natural sunscreens. There are so many good things about it. To start with, it doesn’t leave any whiteness on your skin, yay!! That’s a really positive thing as so many natural sunscreens leave your skin feeling slightly white. The sun cream has a yellowish colour and feels slightly greasy but that feeling disappears after it gets absorbed into the skin. It feels really nourishing as well and I don’t think I would be comfortable applying it onto my face as it’s so rich. While testing this sun cream I only used it on my body and it protected me well in hot Slovenian sun. It didn’t give me any sunburns and for this reason I am really happy to recommend it. If you like the sound of Odylique Natural Sun Screen and you want to buy it you can get 15% off on LoveLula’s website, just click here and wait for the pop up to appear (first time customers only). I bought a couple of Jason natural sunscreens quite a few years back, one for me and one for my boyfriend. They were OK but I am not sure I would buy them again. I found their scent a bit weird and creams quite thick. However, in terms of sun protection I didn’t get a sunburn when using them. EDIT 25.07.18: Since then, Jason have changed the look of their sunscreens and it’s quite possible that the formula changed as well. I chose Jason Sport Natural Sunscreen SPF 45 for a clear reason. I wanted to use it for cycling and hiking and I didn’t want my skin to get wet after being active for a few minutes. This sunscreen is sweat and water resistant and I can confirm this is true, it worked very well when I was active. The SPF 30 sunscreen did a good job at protecting from sunburn but my boyfriend didn’t love it. He wanted the sunscreen from Green People instead! Unfortunately, Jason use Phenoxyethanol in their sunscreens but as mentioned above this should not put you off. Their sunscreens are really affordable and suitable for the whole family. They contain no nano particles, no alcohol and are suitable for sensitive skin. EQ is a lovely brand well worth considering. Their products are certified by ECOCERT® and COSMEBIO® accredited. They are never tested on animals. Furthermore, all their sunscreens are non-toxic to coral reefs and the marine environment. I have tested two organic sunscreens from EQ: one with SPF30 and one with SPF50. EQ EVOA SPF30 sunscreen is great – it doesn’t leave a white cast behind and 99.2% of its ingredients are from natural origin. It doesn’t contain parabens, PEG and any allergens, which makes it suitable for sensitive skin as well. You can also use it on your face. The cream offers protection from both UVA and UVB sunrays. I would recommend this organic sunscreen to anybody, regardless of their skin colour. EQ EVOA SPF50 sunscreen is very similar to EQ SPF30 sunscreen but it does leave the skin slightly white so it’s more suitable for people with really fair complexion. It’s also great for children. Read more about organic sunscreens from EQ here. Lavera SPF30 Sun Cream – great for sensitive skin, offers reliable sun protection. Full review here. Madara Age-Protecting Natural Sunscreen SPF30 – great sunscreen if you want to prevent ageing, no white cast! Full review here. 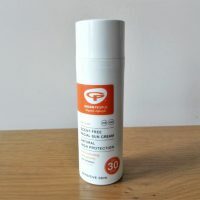 Green People Sun Lotion SPF30 Scent-Free – great for sensitive skin, it moisturises the skin and protects it well from the sun. Full review here. Green People Organic Children Sun Lotion SPF30 – designed especially for children, won a Mama & Baby award from the Beauty Shortlist. Full review here. So there you have it, a good selection of natural and organic sunscreens to consider buying this spring and those to avoid. What’s the best natural sunscreen you ever tried? * This post contains affiliate links (if you purchase a product after clicking on a link I get a small commission which helps me maintain this website and keep all the content free for you). Haha, it’s good to hear that Green People’s sun creams are good for that. I know it’s not that many out there which wouldn’t cause skin to break out. I have now bought this sun cream and wrote a full review on it. It’s pretty good actually and I am happy to recommend it. I’m always so careful to make sure I use sunscreen. I’m terrified of burning. I’d rather just not tan than have my holiday ruined our risk sun damage! It’s great to hear you look after your skin so well Corinne! There should be more people like you.. I see so many sunburnt British people abroad, it’s really not good. Green People contains Nano particles!!!!! What a con! Hi Ellie, sorry to hear that you feel this is a con, but it’s not. I have clearly stated that Green People use nano particles in their products and I am not deceiving people in any way (maybe you haven’t read the whole article?). Green People have explained their reasoning on their blog and I linked to that as I want people to be aware of this and to learn more about nano particles. It’s up to an individual to decide whether they want to use Green People’s sun creams or not. 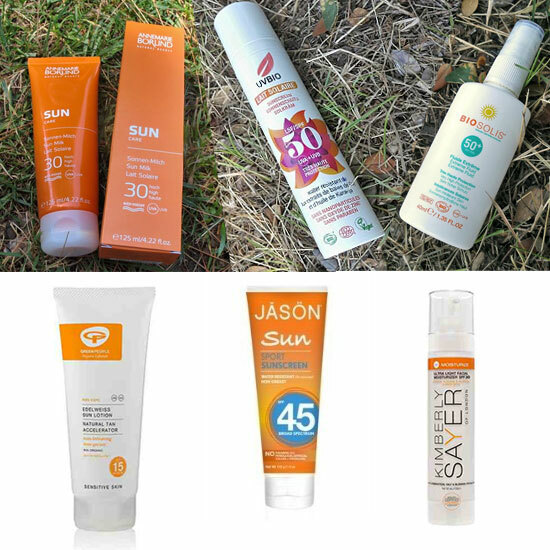 I have had a good experience with their sun creams and this is what I talk about in this blog post. Hey, thank you for your article. It’s very helpful. Useful article, thanks. I’ve used Green people for children for the past two years on my two girls now 5 & 2yrs and its been great. I keep them protected as much as possible but they love being outside & they have never come close to burning with Green people even when we’ve been on overseas holidays. I’ve used Lavera on them before & also myself & my husband but found it too thick. I will try Green people for myself aswell based on your comments. Hi Jane, yes Green People’s sunscreens are quite good, hopefully you will enjoy using them on yourself as well. I am glad you found my article useful. Really useful article. Thank you! Do you know what the shelf life is for these. My Green People sunscreen has been lasting for quite a while. Should I replace it after a certain time, do you know? Hi Janelle, on your sunscreen you can find a symbol which tells you how long the sunscreen will last after you’ve opened it (6m or 12m, for example). Normally, for natural sunscreens, it’s 6 months but some of them are ok to use for 12 months. It’s not recommended to use the sunscreen longer than it states on the packaging as with time it becomes less effective so it’s better to throw your old sunscreen away and buy a new one. I won’t be surprised if the product you use irritates your skin, it’s quite common with non-natural products actually. Is your skin quite pale? If you are after a natural spf 50 sunscreen, the ones that I’ve tried all leave your skin slighly white, including EQ EVOA Organic Sunscreen which I’ve tried recently. This is not a problem if your skin is really pale but if it’s not I don’t recommend you use these sunscreens and go for spf30 sunscreen instead. I recommend Odylique SPF30 sunscreen (https://www.lovelula.com/products/odylique-spf-30-natural-sun-screen-100ml?atk=xajyVFoF9ZWdWrXf8M1vZg) and Green People sunscreens (http://tidd.ly/a7c3b808). Have you tried Forever living suncream? It’s amazing for my daughter’s skin. She gets ezcema and is very sensitive to other creams. It works really well as an after sun too. 90 mins water resistance and it doesn’t leave you feeling greasy or stain clothes! I haven’t come across Forever living suncream before but it’s good to hear it works very well for your daughter’s skin. Is this the sunscreen she’s been using – https://s3.foreverliving.com/a1Pd0000002IgDbEAK/1443032003449AloeSpraySunscreen_ENG.pdf Unfortunately, after checking the ingredients’ list I can see lots of skin irritants such as methylisothiazolinone. I wouldn’t use this sunscreen as it’s not very natural. I haven’t heard of Suncare before but thanks for mentioning it. I had a look at their website now and they sound like a great brand. The only thing I would say is that they display the key ingredients for each of their products (which are fine) but not sure whether there are any other ingredients in each product, so before buying anything I would definitely contact them and ask them about that. If you want to try another sunscreen I would recommend Odylique or Green People, followed by EQ EVOA which also do spf50 (but it leaves a slight whiteness on the skin). Thanks for your reply. Unfortunately I don’t think we assume that “perfum (fragrance)” is coming from essential oils. If they fragranced their product with essential oils I’m convinced they would write the latin names of these in the ingredients list (I think they are obliged to actually) and not simply putting “perfum”. Essential oils are more expensive so there’s no reason why they wouldn’t boast about it if they’d gone to those lengths. If you go to EGW.org/skindeep and type in perfum the search engine would tell you this is a synthetic ingredient. It’s a shame that most skin care companies can’t stick to entirely natural ingredients. It’s very hard to find. Neal’s Yard is a good example of a skin care brand that only uses essential oils to fragrance their products, but they also very much highlight this. I think, if a company uses essential oils there’s no way they wouldn’t tell the consumer about it as it’s an expanse they have decided to take on in order to keep the products free of synthetic fragrance. Maybe they should be more clear on their labels about this, not to confuse customers. I hope that helps.